Jumpstart your life at Elan 41 Apartments. With contemporary spaces, incredible amenities, and picturesque views, your new apartment in West Seattle, Washington, is here to support your modern life. Our pet-friendly community offers easy access to green space, as well as spectacular views of the Olympic and Cascade Mountains, Puget Sound, and downtown Seattle. Your new apartment is ideally located in a charming courtyard community within minutes of the West Seattle Bridge as well as the Commuter Rail, perfect for employees, explorers, and fun-seekers. If you need to travel for work or pleasure, we’re also situated just 12 miles north of Seattle-Tacoma International Airport. At Elan 41 Apartments, you can let yourself unwind. Host a spontaneous get-together and fire up the grill at the outdoor barbecue station in our lush community courtyard. 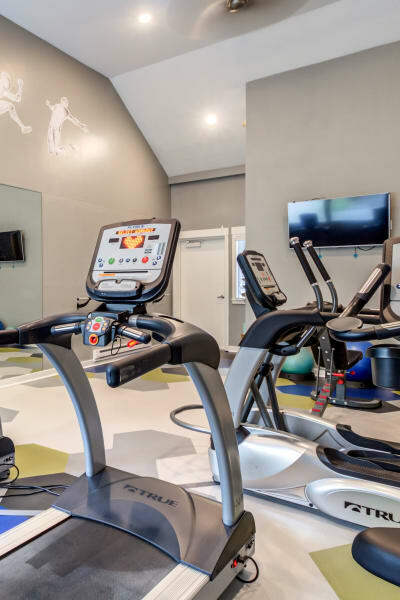 Inside our luxury clubhouse, you will find our well-equipped 24-hour fitness center. From cardio machines to free weights, you can reach your fitness goals without leaving the community. We also offer convenient bicycle storage for our weekend cyclers and daily commuters. If this sounds like the life for you, Elan 41 Apartments is the place to be. Call us today to schedule your tour of our West Seattle, WA, apartments for rent near CenturyLink Field.